A tiny prototype fuel cell the size of a thumb has been developed by Toshiba. The Japanese electronics giant said the methanol fuel cell could power a gadgets such as a digital music player for 20 hours. Fuel cells generate electrical power by catalysing substances such as hydrogen and methanol. Toshiba hopes that by 2005, the fuel cells could be used in handheld electronic devices instead of lithium-ion batteries. Fuel cells have been touted as a green power source for the future as they produce electricity by converting hydrogen and oxygen into water. Many companies are working on developing the technology that could replace conventional batteries. The main obstacle has been making the cells small and inexpensive. The prototype developed by Toshiba measures 22 millimetres by 45 millimetres (0.88 inches by 1.80 inches) and weighs 8.5 grams (0.29 ounces). It works by mixing methanol with air and water to produce 100 milliwatts of electricity, which the company says is enough to power a MP3 player for about 20 hours on a single charge of methanol fuel. Last year Toshiba unveiled a prototype fuel cell designed for future laptops, while rival NEC produced a notebook powered by a built-in fuel cell. 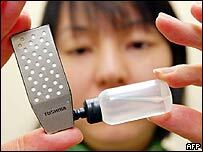 Toshiba expects its tiny fuel cell will go on sale in 2005.